A hard day- fitting for the last in what has been an incredibly tough year. Tomorrow is my birthday. This morning I crossed the 45th parallel. For a long time I have been searching a way to differentiate the past from the future, a reason why tomorrow will be different from yesterday. I have made promises for tomorrow so many times, only to fall short. It’s like I’ve been saying “I’ll be different starting now….starting now…..starting now…” and after so many failures it’s lost meaning over time. I wa nted a line in the sand between the past and the future and now I have one, an invisible but perfect line. I want to be a person who keeps promises she makes to herself, to others. I haven’t been for a long time. I wonder if that’s part of why I didn’t get angry at Lance when he broke promises to me, it’s almost like I didn’t expect other people to do for me what I couldn’t do for myself. I set expectations for myself nearly every day and veered over them almost as often as I laid them down. It was hard saying those words and I honestly believe I can make them come true. It felt right commemorating that milestone in that way. I wondered superstitiously if this might really be the halfway point in my life, literally not just symbolically. I washed my hands and face in the water, noting how there was dark dirty soil on the sides with a seam of sand running through the middle with clear water washing over it. Imperfect but clean. Funny, I had my own little baptism here in a place called the Jordan River Valley! 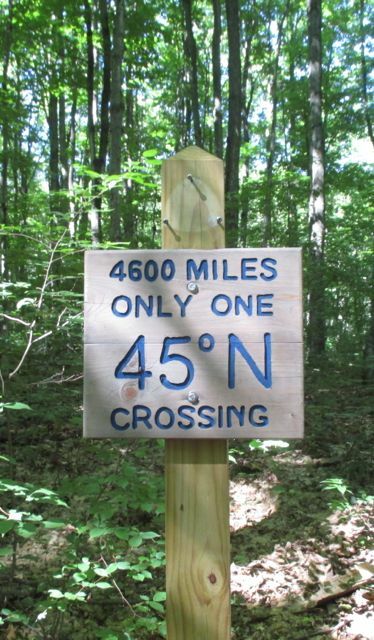 Later I passed a sign marking the official 45th parallel but I and already had my ceremony. As I walked today, I recounted the events of my life with an eating disorder. It took a very long time both because it’s a long story and because I resisted it all throughout. The feeling I was left with when I finished was of extreme sadness and regret. I wanted to apologize to Lance for being half gone, for lying, and for subjecting him to my illness. I felt like our marriage was collateral damage of my eating disorder. At the end of the day, I got lost, ran out of water, and was physically and emotionally drained. In the woods and out of water, I looked around for signs of a lake, river, well. I checked my map. I thought about how far back the last known source was. I anticipated running into another hiker who might be able to help me out. So when I arrived at a road, a fairly busy road, my first reaction was relief. I was certainly not in danger any more, there are people easily accessible to me and water was easily accessible to these people. But the relief didn’t last. Hiking on that road without water was not the same as being in the desert starving in a drought, helpless and alone, but it was also not the same as sitting in the kitchen with us and having access to as much and however much I wanted. The difference was that I was dependent on another person to give me the things that I need and I had to ask and they had to say “yes.” A person in an emergency can approach any stranger and ask for help. But I didn’t have a severed limb, I wasn’t close to fainting, I was just out of water. I absolutely needed it but I didn’t absolutely need it that second. So each car was an opportunity but also an option. And so I stared straight ahead, stubbornly shamefully walking along the road and I delayed the decision as long as I could. Hoping that one of them might offer the thing that I was too proud to ask for. At one point, a passing car honked at me and I turned to face it expectantly, only to see the driver flashing me her middle finger. I felt like I’d been slapped! My mouth drop open in shock. I knew I had to approach someone eventually because I was about to leave the main road for another trail and didn’t know when my next water source would be. Finally, I saw a house with someone sitting outside on the front porch. I was apprehensive as I approached. She was watching me approach, probably judging me. I was judging her, imagining her to be some caricature of an obese trailer park woman. We stared at each other as I walked up and finally I spoke up “I’m on a hike and I ran out of water, is there any way I could use your hose to fill up my canteen?” She said yes, but no, and invited me, a filthy stranger, into her house. She gave me a cup of ice water and let me fill up my other containers. Her name is Eleanor. We sat on her porch while I finisher my cup of water. I told her about my trip and confessed that I had just gotten divorced and she told me today was the 17th anniversary of her husband’s death. It was the sweetest little honest confession between us both. I could feel the tears coming and she must have seem because she said “Now I’m gonna worry about you!” I told her I already have a mother and please don’t worry and then took down her address so I can write her when I make it home safe. I’m so glad we found each other today, I think we both needed it. But sometimes, saying the sad parts of my life so matter-of-factly makes it almost worse. Leaving her house, I cried and cried. I am near a dirt road now and my first thought was to set up camp near a little turn-around off a corner in the road. Then I realized that it’s Friday night and saw skid marks in the dirt. I can just imagine some guys with nothing better to do with their weekend drinking and driving around out here so I decided not to camp there. I walked back a little ways to a railroad crossing and now I am set up in what is basically a ditch next to the steep incline between the natural ground level and the raised up berm of the railroad tracks. It isn’t enough flat for me to set up my tent on the ground so I am in hammock mode for the night. Hobo all the way. I’ve been on the trail a week now, I think it’s getting easier but I am just taking it one day at a time. Tomorrow is my 28th birthday. Staring at my map just now before bed, I realize that, if I hike 28 miles tomorrow I can make it to Petoskey. I’m going to do it or at least try. 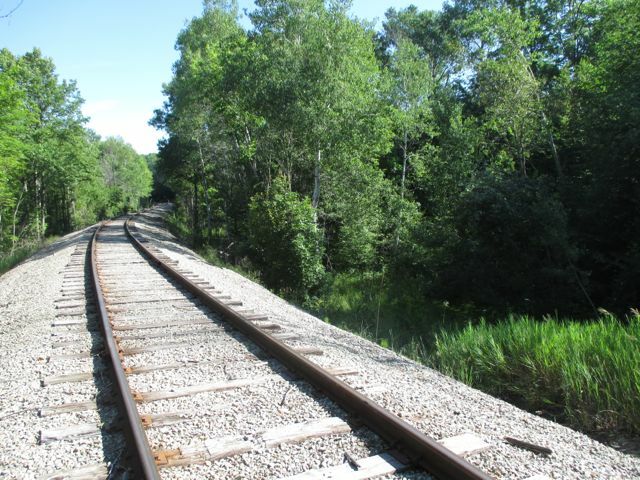 This entry was posted in Left of East and tagged 45th parallel, Leftofeast, michigan, north country trail, Recovery. Bookmark the permalink.